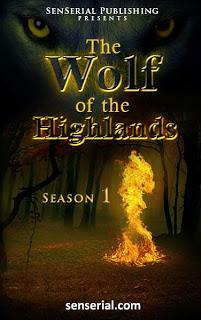 The Wolf of the Highlands by Bil Howard is a Senserial publication. This book was released in March 2013. I received a copy of this book from the publisher in exchange for an honest review. First of all I must explain a little about Senserial. This publisher releases stories in various genres in serial format. Usually, there are three "Episodes", with four chapters in each, totaling twelve chapters. You can buy one episode at a time or purchase all of them at once. The version I got has all twelve chapters. Ray is a man currently struggling with life, where he belongs, what his role is. When out in the mountains, grieving the loss of his wife and daughter he is approached by a lone wolf. At first his instinct in to draw his weapon, but he has no reason to shoot the animal and the two end up forming an alliance of sorts. Ray is also visited by a man calling himself Angus McGregor, an ancestor of Ray's apparently and his spirit guide. Ray doesn't know if this man is real, or if any of the things he refers to as "experiments" is real or if he is dreaming or hallucinating. Ray goes on some rather wild adventures before he finally comes down and tries to adjust to life once more in a normal way. This is a story one man coming to terms with past, his present, and his future. He must make peace with all three. A vivid, mind tripping, imaginative story that could just be read as a fantasy or could be taken as a novel filled with symbolism. I had a bit of trouble getting into the book at first. I didn't know what to make of it. After the first four chapters, though, I found myself becoming more engaged in Ray's various adventures. Ray often feels unsure about everything and it really isn't until the very last words are spoken that it all clicks into place for him. I love books that are off the beaten path. This one fits that bill perfectly. I'm not exactly sure what genre to place this one in. Fantasy, adventure, fiction and literature will have to do. Overall this is one gets a B+.